This article is written by Alan Stares. 1991 was a pretty defining year for me. I was thirteen, I’d just changed to a much better school where I still have my pals from and most importantly I saw Terminator 2: Judgement Day, possibly the single most important film and step into maturity for a young geek with the notable exception of Tim Burton’s Batman in 1989 – itself another milestone and rather good Amiga game that I shall get to in another review. So we all know the story, T2 was a smash hit, it revolutionised the special effects industry and brought unheard of depth and emotion to what was still a pretty looked down apon genre with film snobs and won just about every award going and rightly so. It was only natural that game licences of the film would be sold and one of the conversions was for the computer at the top of it’s (pardon the pun) game the mighty Commodore Amiga. Now, if you are an old Amiga Jedi like me you will remember what a truly awesome and ahead of it’s time machine it really was, in all areas. You will no doubt unfortunately remember that it’s game licences for movie titles were in a word, if I can use my native Glaswegian here ‘Baws!” (Balls!). Yes, just about every movie title for the home computer market was an absolute disaster. Ocean software were the prime culprits in this disease (with the notable exception of the glorious Robocop 3) and the whole fiasco was obviously orchestrated by some absolute dung soldier in a suit who has no interest in games but kept buying up film titles and pushing them through a factory like assembly line of wanky developers with zero affection to what was being made. T2: Judgement Day for the Amiga was torn a new bumhole by reviewers but was it that bad? The graphics are bog standard at best but never actually that bad. 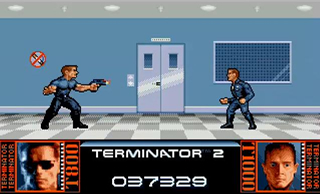 The game opens with a pretty crisp digitised image of a hilariously cross eyed T-800 (Not a 101, that’s the Arnie skin model for all you geeks out there) The Animation is actually really decent and the sprites are ok with some alright but flat backgrounds. Some sepia toned digitised footage (yes footage) from the movie is included between cut scenes which was mega impressive for the day. Sound wise is a bit limp willied if I’m to be honest. A half arsed attempt to recreate the famous title theme at the start and completely ignoring the superb sound capabilities of the Amiga. Some decent sound effects are scattered around the fuzzy and distorted samples. Zero in game music apart from a generic little ditty that plays over the puzzle sections. So how does it play? Well the game is split into a few different types of play, a one on one fight, a overhead chase scene and a puzzle type section. This does indeed make the game varied and to be frank it’s not bad fun but it’s as shallow as a puddle of pish in the gents toilets. 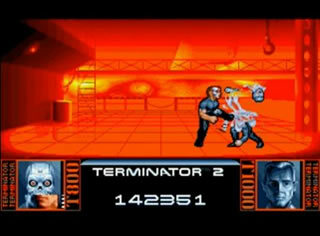 In the one on one sections Arnie moves like he just shat his pants and the controls are quite sluggish with a what seems like a pre determined set of moves from just bashing the fire button which eliminates absolutely all skill from the fight. The top down sections are no better programmed than old similar 8-bit games that were kicking about 10 years earlier. The puzzle sections are a nice idea and they are entertaining enough but the element could have been further expanded and mixed in with the rest of the game rather than just ‘lets stick this bit in here as a level’. In relation to that the game is painfully short even though it has 8 Levels and it can be completely finished in just under 12 minutes. Eeeech, I don’t really know how to say this. It’s sort of fun and has some ok bits in it and in 1991 it was the closest thing you could get until the film came out on video (HA video!) but it is an extremely basic title with the minimum of effort put in and far too relent on the vast success of the superb film. Nostalgia value for anyone who played it back in the day. Otherwise avoid! Alan Stares is a long time gamer and chiptuner. You can listen to chiptunes from classic games systems and covers of classic game music. You can listen to some of them at Prototron.